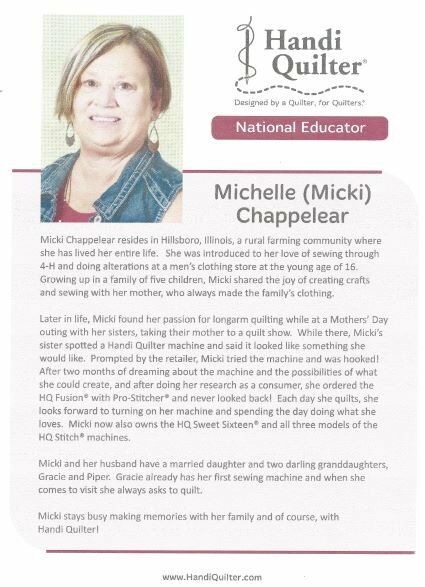 We are proud to announce that Michelle Chappelear, Handi-Quilter Educator will be here May 17th and 18th, 2019. She will present 2 days of classes. Friday classes are Fast, Fun, & Fabulous Free Motion Quilting & Backgrounds, Borders, & Blocks. Saturday classes are Creative Textures & Fills and Ruler Essentials. The price for both days is $150.00. Please call to reserve your spot as soon as possible as space is limited. Don’t forget to have your machine serviced. It’s very important to have it cleaned and serviced at least every 2 years. This keeps your machine running in tip top shape. This will help extend the life of your machine. Darrell does all of our service here in house and turn around is 2-3 days.